Payroll Control Center (PCC) is for sure a game changer for running and monitoring SAP HCM payroll or Employee Central Payroll (ECP) . There is lot being said about the difference (or no difference) between ECP and SAP ECC systems and its has been construed that not much is changed from SAP ECC To ECP. High percentage of the opinion is that ECP is nothing more than SAP payroll system placed on cloud as such with has the same look and feel. This is not entirely true. The basic payroll configuration (SPRO nodes for adding wage types, payment , deductions, schema/PCRs) remains same for sure but lot is changing from the perspective of user experience, consulting , configuration and integration. Read on. 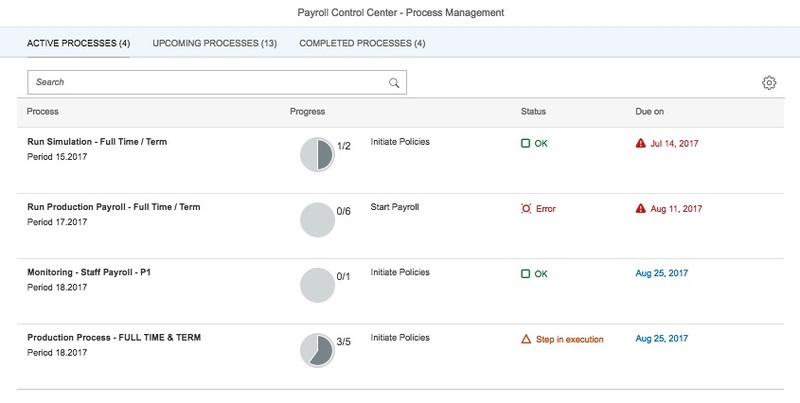 Employee Central + SAP HCM Payroll on-cloud + Payroll Control Centre. EC is major component in this implementation formula which is used for Managing Organization management (when Point to Point a.k.a P2P integration is leveraged for EC to ECP data flow), Personnel Administration ( All done in EC) , Payroll master data maintenance (Recurring/one time payments and deductions, address details, cost distributions, bank details are done using EC portlets) , even tax assignments, garnishments, benefits administrations, family details, address, pay statement/year-end tax form can be viewed/updated using user-interface mash-up with payroll system. Running the simulations or productive payrolls or post payroll activities will be possible using PCC implemented in EC. Thus, much can be executed via Employee Central and PCC is a powerful enabling agent for this. Due to this fact, SAP payroll consultants need to learn new regime of configurations in EC and understand integration configurations such as code value mapping between EC/ECP and Payroll Control Centre templates.We wish to underline how PCC can be leveraged in context of future of SAP Payroll (HCM and ECP) projects. This brings us back to the topic of this blog – PCC overview and outline of technical/functional steps of implementation. We also intend to highlight the skills required for the implementations. Definition of payroll control centre is provided on SAP help portal ,we would like to focus more on the capabilities of the tool. a. Process Management – Payroll admin can run Payroll Simulations, view results, run checks , run productive payroll in steps ( release payroll, trigger payroll run, posting simulation , payroll checks and exit payroll), Print pay statements, generate bank file , print checks and post payroll results to finance or review off cycle payrolls , All from PCC while logged in to Employee Central or through SAP Fiori Launchpad. The screen shots above shows only basic implementations whereby payroll processes can be managed by EC payroll . The tool comes handy in reviewing the current status ( stages) of the payroll. The upcoming processes tab shows the processes which are due or overdue. The upcoming processes can be started and moved to active processes tab where can be run and confirmed a step at a time. There will opportunity to review results at every step. 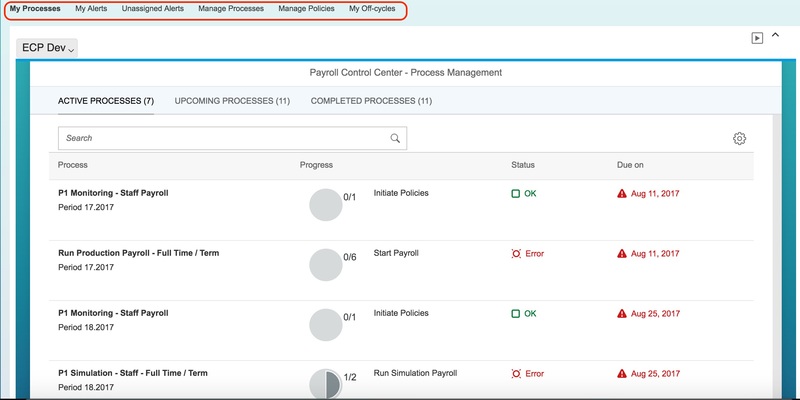 Once the last configured process step is confirmed by the payroll manager , the process will move to completed processes tab. The completed processes can be revisited any time ( deleted from backend) to view the results. Sleek improvement from traditional way of running payroll , whereby the payroll control record was the only tool to define the stage of payroll but will still not define the interim steps and keep log. This feature is easy to implement and should be the first step in order of implementations since standard programs and templates are provided by SAP ( in ECP / ECC nodes) . We recommend not to overdo while learning to implement PCC and only concentrate on running simulation / productive payroll using PCC. Skip Initial policy or monitoring steps from all the documentations or configuration nodes at this stage. b. Monitoring – Also termed as one step monitoring in PCC parlance , the tool is capable of carrying out various pre payroll checks . The process generates the test results, shows errors in the payroll and help payroll manager to assign the errors to the payroll administrator as well as monitor the resolutions of the errors. Monitoring processes can be assigned as a step in productive payroll run process for robustness of payroll process. This will be possible with the help of back-end configurations and some ABAP development or manually copying pre-delivered KPIs using the rapid deployment solution package. This part of the project requires the ABAP resource working together with the Payroll functional to explore and leverage the functionality. Lot of room for innovation here !. NOTE – Be Aware that implementing the payroll checks is time consuming activity, requires additional time , skills and resources. PCC as whole and payroll checks in particular should be mentioned in carefully drafted SOWs going forward. c. Manage Processes / Policies – SAP recently released simplified configuration nodes using which PCC is further strengthened empowering payroll manager to introduce more processes and assign policies using the front end which otherwise is a backend activity. Based on the roles based permissions various options can be made available to payroll managers / payroll administrators. Following screen shot shows all the option available in Payroll Control Centre at the time of writing the blog. In next section, we would like to share recent experience towards setup towards implementing Payroll Control Centre (PCC). Please note that this experience is from our Employee Central Payroll (ECP) Implementations. Though the notes will also be applicable for the setup where Employee Central is integrated with On-premise payroll system, provided you adapt ECP specific steps to on-prem side and skip EC steps. Since the motive behind writing this blog is to provide overview and list various implementation steps. 1. Provisioning Setup – One of the first step after receiving the access URL from SAP and VPN access from client is setting up the provisioning to enable ECP, PCC , service provider settings, review the data models for visibility of certain important data fields. 2. Employee Central Admin Centre Setup – The admin centre configurations include SAP system configuration for the connection setup, payroll system configurations and payroll system assignments to the payroll administrators and managers as well as payroll control centre configurations object. 3. Setup Role Based Permissions for EC Payroll Objects – All objects enabled for payroll control centre must be given access to the payroll managers and payroll administrators by setting up the appropriate permission roles and permission groups. 4. SAML2 Configurations – Security Assertion Markup Language (SAML) configurations are to be carried out in provisioning as well as in the back-end SAP ECC / ECP to get going with the authorizations. 7. De-clustring Payroll Results – One of the requirements for PCC processes to run and fetch data using the complex queries is that payroll results are available in backend in simple transparent database tables than in the traditional cluster tables ( PCL1/2) which is in binary string format. This way tables will be available to be viewed using the SE16 transactions. The system synchronously then updates the payroll cluster as well as de-clustered tables. Need be only selected tables can be de-clustered. 8. PCC relevant SAP Node Configuration / Build Validation Classes – There are set of SPRO nodes in SAP Payroll systems to setup the process and policies for PCC. Payroll Control Center provides the way to efficiently control complete payroll process i.e, pre payroll validations, simulations , payroll run and post payroll activities from the Employee Central or Fiori Launchpad. This reduces the need to go to backend SAP system and run processes transaction by transactions or even reliance on the tough to stabilize process models. PCC is a new user experience for payroll admins and payroll managers to manage and support the payroll process. In the second half of this blog , steps are listed for consultants to provide overview of implementation. The skill set required for each of the step is mentioned so that it helps to gauge and plan in advance the resource requirements before commitments are made. We intend to share our experience towards each of these steps in subsequent blogs. Hoping that this blog will add some knowledge to your understanding around the topic. Feel free to provide feedback / improvement and share your learning’s in the comments section. Gobi Sandhu is an experienced SAP consultant, blogger , mentor and project manager with expertise in SAP HCM/Payroll, SuccessFactors Employee Central, EC Payroll, SF Recruiting and on-premise – cloud integrations. Jai Karan Korpal is an experienced SAP and SuccessFactors Integration architect, speaker, blogger who specializes in SAP HCM(PA/OM/ESS/MSS), SuccessFactors Employee Central, SF Recruiting and integration technologies such as PI/HCI/Boomi. It is the overview on SF ECP – PCC functionality. Thanks for providing the inputs. Great article guys. I have been running into some issues setting up ECP recently – would you be able to have a chat? If not, when is your followup article released? Hi Mark, Follow Up article is just submitted this week, hope to have it released shortly. Thanks guys for the interests and queries here as well as on linkedin and thanks for your patience.